Last month I signed up for this 28 day program with Jordan Lark of Evolutionary Health.This program gave me the kick start to get back on the clean eating wagon. The program ended on 31st October and I continued with clean eating.I say clean eating in the broadest sense of the word.But mostly I am trying to eat non-processed and low carb.I have been a little slack this week with Diwali and outings,but good overall. Today we spent most of the day out.We left home after a Brunch of eggs,Sausage n toast and went to the Royal Botanic Gardens.A fun afternoon was spent walking around,splashing around the mini-stream at Ian Potter Children’s Garden and rounded off with some Ice-cream and burgers and wraps.After all the gluttony,my tummy wanted salvation and this salad came to the rescue.I mean what’s not to love when there’s beans,avocado,and the usual suspects that make a salad. 4-5 lettuce leaves,washed and torn. Just toss everything together and chill in the refrigerator for 20-30 minutes,before serving. 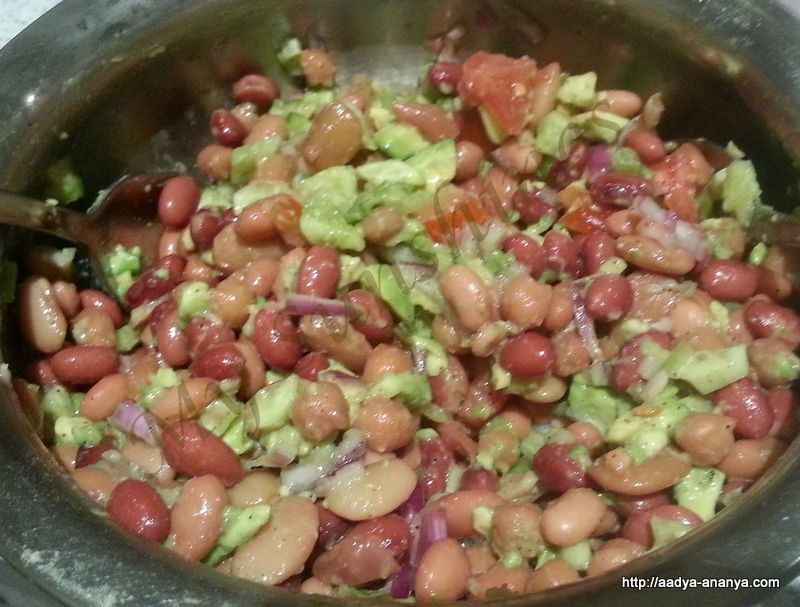 I make a bean salad/dip from showmethecurry dot com…..pretty similar….do check that one out too.